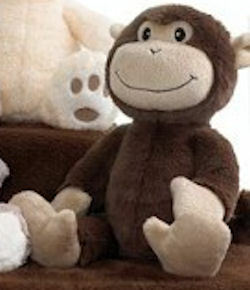 I am looking for a Charter Club Ultraplush brown and cream monkey. This has become my daughter’s favorite stuffed animal, and I am terrified that she will lose it or something will happen to it. Macy’s no longer sells it, and I can’t find a another one anywhere. I just lost my monkey this weekend in Toronto and was devastated. Although I’m an adult he held great sentimental value. My fiance and I tried all we could to find him and have looked everywhere to see if we could even get a replacement. The bad news: we couldn’t. The GOOD news: My fiance got on the phone with the corporate headquarters and a woman said that the ultraplush is a seasonal thing and they bring them back every year…so they should be back around thanksgiving. I know it’s a bit of a wait but at least he’ll be there. I got mine in 2009, not sure when you got yours but it seems to be a yearly item. If seasonal did not work out here is the monkey on ebay! My daughter got the plush monkey for her first Christmas in 2009. He just recently went missing and we are all in a panic. We cannot find him anywhere and are willing to pay top dollar for another monkey. Have you tried searching “charter club monkey” on ebay? Sometimes they have it but it will be expensive usually. Also, which one are you looking for? The white one is always shown on ebay. I have checked ebay! We are missing the brown one and will pay whatever it takes to get another one. We are desperate! 🙁 Sorry to hear that. Maybe check ebay again every few days to see if it’s updated. Maybe also try craigslist for stuffed monkeys? I wish I could be more of a help. I know I would constantly search each morning/night for mine until it showed up!